At our January Faith Formation session, where we walked through the liturgical year, there were many questions about the Stations of the Cross. This traditional prayer of the Church gives us an opportunity to walk with Jesus from the time of his arrest to his burial in the borrowed tomb on the eve of the sabbath. Some churches have sculptures or paintings depicting the stations, and some retreat centers or other facilities have outdoor paths with representations of each of the 14 stations. There are many different forms of the prayer that accompanies the stations. Many churches, and may of the prayer booklets, have added a 15th station -- the Resurrection of Jesus. The crucifixion makes no sense without the resurrection. We Christians never just leave Jesus in the tomb. Life always trumps death. God always prevails over suffering and sin. The Stations of the Cross are more appropriately understood by older children. The reality of what actually happened to Jesus is very violent and can be difficult to explain to the littlest of children. When our parish offers Stations of the Cross, we provide small coloring booklets for the younger children so they can experience the Stations of the Cross in a more accessible way. Loyola Press offers a multimedia presentation of the Stations of the Cross that you can pray together with your older children. The reflections give us much to talk about as a family. Oscar Arnulfo Romero was canonized (officially declared a saint of the Catholic Church) on October 14, 2018. St. Oscar Romero was born into a large family in El Salvador in 1935. He became a priest and then a bishop. As a bishop, he became a great advocate for the poor and oppressed people of his country. He spoke out against those in power who caused the suffering of his people. He used radio broadcasts to carry a message of hope in God's love to the suffering. Because he courageously spoke the truth and worked for justice, he was killed. He became a martyr, a person who has died for his faith. March 24, the anniversary of his death, is his feast day as a saint. To learn more about St. Oscar's life, read this short biography and time line. To mark his feast day, here is an activity you can do together as a family. 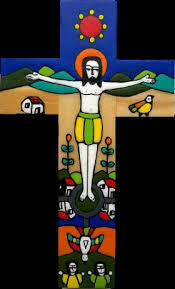 You can either color the Salvadoran cross provided, or use the template to design your own -- or both. While you do this activity together as a family, talk about ways you can help the poor and suffering in the world. Jesus calls all of us to be each other's neighbor! At our March Faith Formation gatherings, we talked about God's infinite mercy and the Sacraments of Healing. Have a conversation with your child about God's forgiveness while coloring this doodle of a great St. Francis quote. Coloring together sometimes helps the conversation flow. 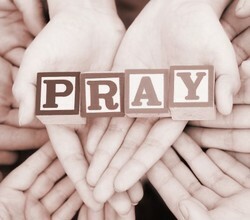 Put your finished work in your prayer space or hang it on your refrigerator as a reminder of God's forgiveness.